Have we reached the age of incrementalism when it comes to tech advances? Intel’s new processors add 10% performance and a little less power each generation. Smartphones all look the same, and capabilities between different slab phones differ little. HDTVs mostly come in 4K versions, whose image quality is hard to see relative to 1080p sets. So what am I missing, and where’s the next big advances in technology coming to utterly wow us? 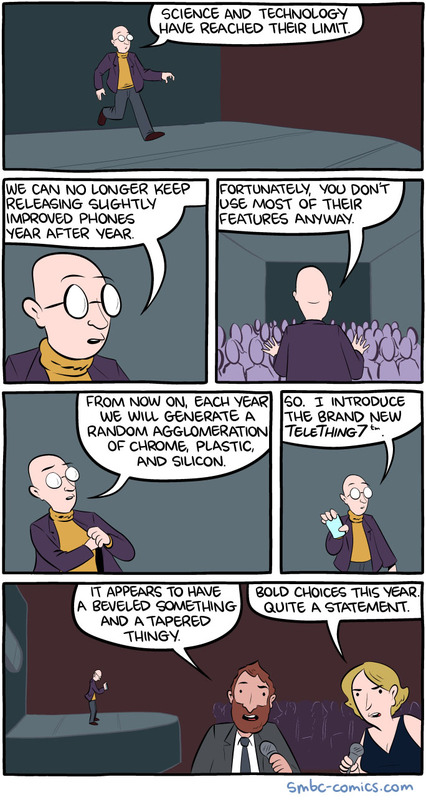 A recent cartoon from the excellent Saturday Morning Breakfast Cereal webcomic started me thinking about this. I’m now using the excellent LG 38UC99 ultra-widescreen monitor. The overall resolution of 3840 x 1600 pixels seems perfect for daily work use and glorious for games. I discuss why the upgrade seemed compelling, even if it seems incremental over the 34-inch, 3440×1440 Dell U3415W I’d been using. I also discuss the process of adapting to a more traditional keyboard, and how much I like the Logitech G810. David updates to MacOC Sierra on his Macbook air, which seems sorta meh. He also notes that Dolby Axon, which has been our online voice comms app of choice, is being dropped by Dolby, so we’re searching for a new one. Current candidates include Discord and Razer Comms. He’s also been taking a look at the Display Fusion app to solve his problems sharing a Windows 10 laptop with an ultra-high res monitor with lower resolution desktop displays and projectors. Along the same lines, he’s looking at Synergy, which allows you to share a single keyboard and mouse across disparate systems. I’ve been playing Gears of War 4. It’s the latest game in the Gears of War franchise from Microsoft, but since I never played the earlier games, I thought I’d give it a whirl. It’s… okay. I talk about what I like about it and what’s not so hot. I also discuss the hot new board game, Terraforming Mars, which is designed by a Ph.D. physicist. David’s been delving deeper into 1.4 patch public test server for Ubisoft’s The Division; he likes it so much, he’s unwilling to play the standard game any longer. We all hope the patch drops soon. Finally, we both love the shiny new trailer for Star Wars: Rogue One. But beware of spoilers, should you obsess about such things.